Home Gaming 5 Beginner Tips for Final Fantasy Brave Exvius! Final Fantasy Brave Exvius is Square Enix’s latest release into the Final Fantasy series for the iOS and Android platforms. This game combines both the town and dungeon exploration of the console Final Fantasy franchise with a signature battling system similar to that of Brave Frontier. It features a deep story with diverse characters from the entire history of the Final Fantasy franchise. Having played the game for the past seven days, I have compiled five beginner tips about Final Fantasy Brave Exvius that can help every budding #FFBEWW gamer start into the game. Getting a powerful character in the early game provides a significant advantage when you embark on your quest. Having a 4-5 star character while your main character (Rain) is just a 2-star character allows you to clear the game with more ease and give you a good head start in the game. 1. Play the game as per normal using a guest account. 2. 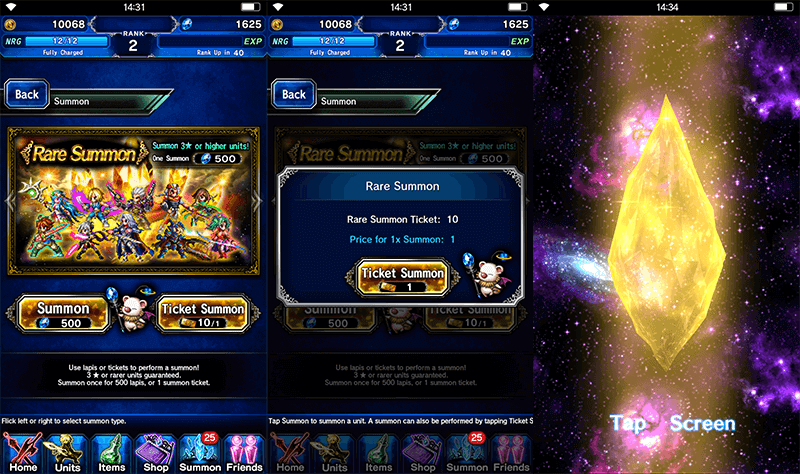 Complete the tutorial to claim your FREE Summon Tickets and Lapis. You can either play the game diligently or simply skip conversation/ story clip so you can finish it in minutes. To skip, just pause the game, and then when you are trying to resume it, you will see the word “skip” which will let you fast-forward the conversation. 3. Proceed until you are on the homepage and have the ability to summon (at least 12 times). 4. Judge whether you are satisfied with your initial summons. 5. Make sure you have a Dummy Facebook account to “throw away” this account. Just login to this Facebook via the options menu. 6. After that, log out of this Facebook account and you will notice that you can start over with a new tutorial. 7. Repeat this process, until you are satisfied with your initial set-up and link this account to your Facebook. As a starting guide, this is something I found online which might be useful. Just like every other mobile game, being a diligent gamer has its perks. Popular game titles are leveraging on this tested and proven fact to ensure that its players always log in daily, and be rewarded. 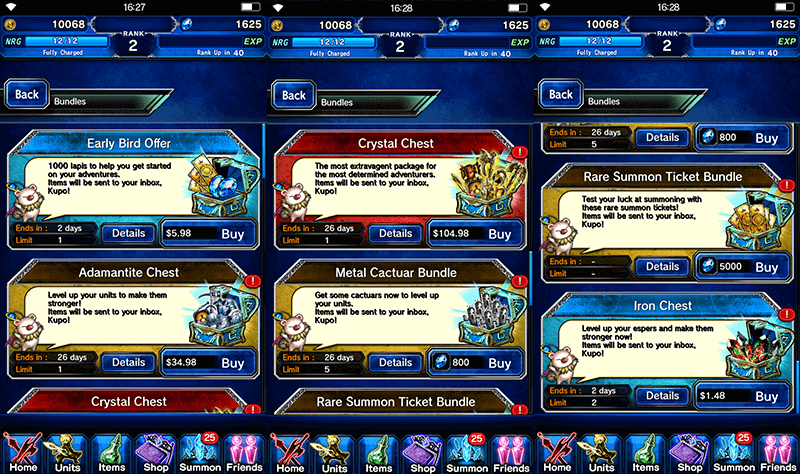 Once each day, players will be given a different reward like Ticket Summon, Lapis, Gils, and items. Therefore, it is best for gamers to check-in at least once a day to collect these perks. Take note of new events. Participating in events is a great chance for new players to level up their new units quickly and at the same time receive exclusive drops. It is imperative for gamers to understand the game from how it is being played to what each attribute of a character stands for. By understanding the game well, you will be able to master your characters and craft strategies to excel in the game. LB: Limit Burst or known as Limit Break at final fantasy series. It increases level/potency with use. Trust Master: Trust value is located on any unit’s stats page (except story units) at the bottom. Trust starts at 0.0% and has 10% chance to increase by 0.1% after completion of any quest. When a unit’s trust value reaches 100%, you receive the reward to the right of the meter. You also can gain 5% base + accumulated % from enhance the unit with a duplicate/same unit. Goes to the next tier when “Awakened”. You can awaken the character when it reach Max Level and have enough materials. Tip #5. Complete Daily Quests and Enjoy the Game! 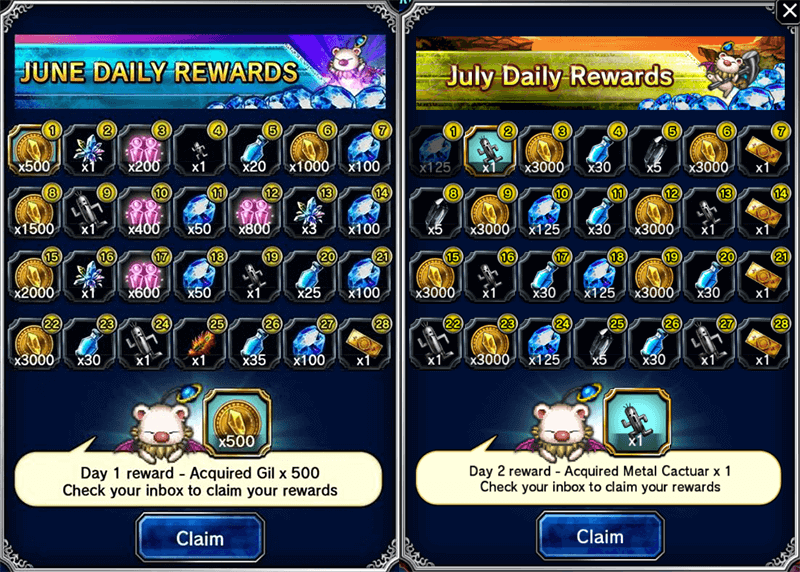 Complete your daily quests to get the 50 FREE Lapis. If you are struggling to progress in the story, do a few experience vortex runs and make sure you equip your heroes with the best gears you have. Although this game is a Free To Play title, players can still purchase perks to gain competitive advantage via micro-transactions. In any case, if you would like to have a significant advantage in the game, you are always welcome to visit the “Cash Shop”. Final Fantasy Brave Exvius is a relatively new game; thus we can expect more upgrades and releases in the months to come. 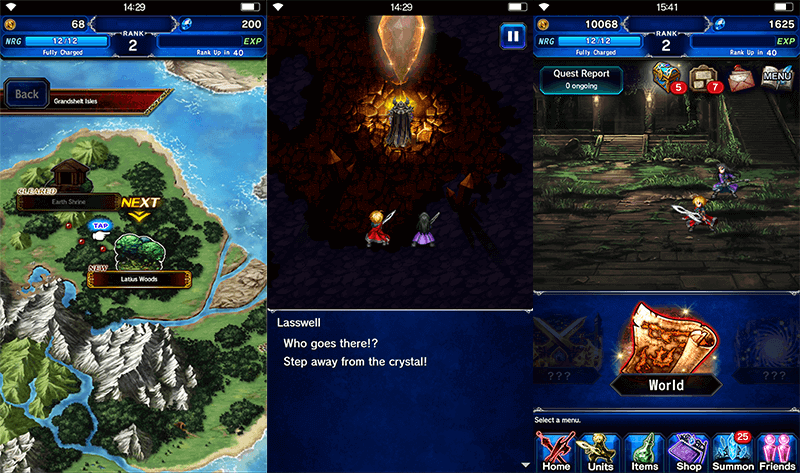 Previous articleFinal Fantasy Brave Exvius Is Now on iOS and Android! Next articleHow John Hanke “Catch ‘Em All” to Create Pokemon GO?